Chronic (Type III) GM1 gangliosidosis is a rare lysosomal storage disorder presenting with predominant extrapyramidal symptoms without visceral involvement. It is the least common of the three variants of GM1 gangliosidosis. Here, we describe a patient with biochemically proven GM1 gangliosidosis with novel phenotypic and characteristic neuroimaging features. An 18-year old boy presented with progressive dystonia since 4 years of age, with onset in the upper limbs followed by dysarthria, dysphagia, mandibular, and lingual dystonia. He developed dystonic posturing of both lower limbs by 13 years of age, which progressed to anarthria, blepharospasm, cervical, and truncal dystonia by the age of 16 years. He developed exaggerated startle to auditory stimuli for the past 2 years. He remained cognitively preserved and never experienced seizures, visual impairment, stiffness, incoordination, symptoms to suggest neuropathy, or any other symptoms pertaining to involvement outside the nervous system. When first seen at 18 years of age, his general physical, ophthalmological, and systemic examinations were normal. He had generalized dystonia with severe adductor dysphonia and exaggerated auditory startle. Cranial magnetic resonance imaging (MRI) done 2 years back showed bilateral posterior putaminal hyperintensities on T2-weighted and fluid attenuated inversion recovery sequences. 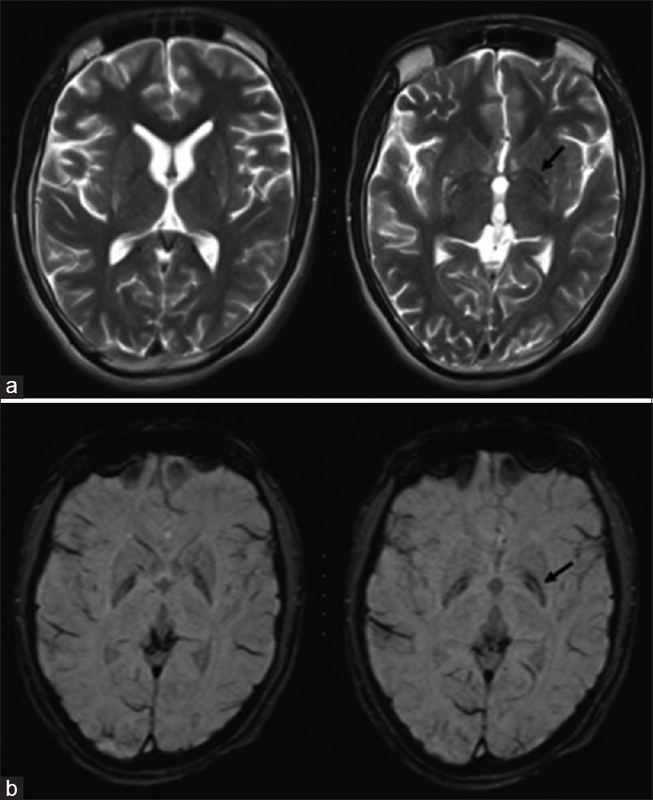 Recent MRI showed progression of the putaminal T2 hyperintensities [Figure 1]a and an abnormal mineralization of the globus pallidus on susceptibility weighted imaging sequences [Figure 1]b. Beta galactosidase level, assessed by the blood leukocyte assay was low (12.4 nmol/h/mg, reference range: >80 nmol/h/mg). He was started on anticholinergics and clonazepam for dystonia and startle myoclonus with which he reported a modest benefit. In our patient, childhood-onset progressive dystonia with prominent orofacial and laryngeal involvement and auditory startle suggested a secondary etiology. A systematic review of adult patients with GM1 gangliosidosis has reported progressive generalized dystonia with prominent facial involvement as the typical phenotype. Parkinsonism was reported in 7.5–48% of the patients, which was not apparent in our patient., Other clinical clues such as skeletal abnormalities on radiography and short stature were also absent. Auditory startle, a unique feature in our patient, is commonly described in the etiologically similar GM2 gangliosidosis but has not been reported in type III GM1 gangliosidosis to the best of our knowledge.,, Neuroimaging revealed T2 hyperintensities in the posterior putamen and evidence of mineralization along the lateral and medial aspect of the globus pallidus in a “wish bone”-like pattern mimicking neurodegeneration with brain iron accumulation (NBIA). This report expands the phenotypic spectrum of type III GM1 gangliosidosis which should be considered in the differential diagnosis of progressive secondary dystonia and NBIA-spectrum disorders on neuroimaging. Roze E, Paschke E, Lopez N, Eck T, Yoshida K, Maurel-Ollivier A, et al. Dystonia and parkinsonism in GM1 type 3 gangliosidosis. Mov Disord 2005;20:1366-9. Muthane U, Chickabasaviah Y, Kaneski C, Shankar SK, Narayanappa G, Christopher R, et al. Clinical features of adult GM1 gangliosidosis: Report of three Indian patients and review of 40 cases. Mov Disord 2004;19:1334-41. Yoshida K, Oshima A, Sakuraba H, Nakano T, Yanagisawa N, Inui K, et al. GM1 gangliosidosis in adults: Clinical and molecular analysis of 16 Japanese patients. Ann Neurol 1992;31:328-32. Hajirnis O, Hegde AU. Chronic GM1 gangliosidosis with characteristic 'wish bone sign' on brain MRI: Another type of neurodegeneration with brain iron accumulation? Mov Disord 2015;2.